This bluetooth module allows any smartphone to control and fly a paper airplane. Powerup 3.0 smartphone paper airplane teaches the fundamentals of aerodynamics, while providing hours of fun. If you have ever wanted to send secret messages off the grid, then this is perhaps the best way to do that. Just write your secret conspiracy theories down on your favorite piece of paper. Take that paper and fold it into a paper airplane, then using your smartphone, fly your new airplane containing your secret message to your intended recipient. Careful though, don’t fly your new airplane into any buildings, we wouldn’t want you to be responsible for another 9/11. If you have plans to smuggle family members across the border then you probably already know that flying is the way to smuggle in style. 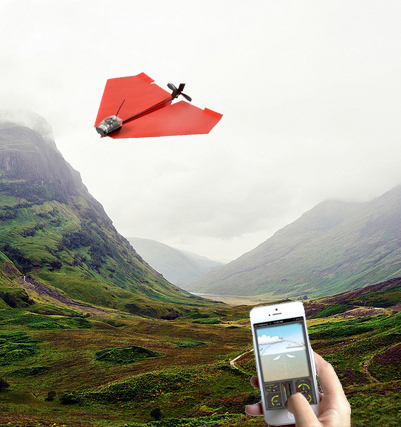 So you should purchase this smartphone paper airplane today, and make your smuggling dreams a reality.